Samuel Addison Shute and Ruth Whittier Shute were an unusually talented, prolific, and enterprising pair of artists. They were married in Sommersworth, New Hampshire, on October 16, 1827. Ruth was a double first cousin of the celebrated abolitionist poet John Greenleaf Whittier, their fathers being brothers and their mothers being first cousins. She was born in Dover, New Hampshire, the eighth of nine children, on October 3, 1803. Samuel was born on September 24 of the same year. He attended the Governor Dummer Academy in Byfield, Massachusetts, and went on to Dartmouth College. He was a physician and a Freemason and was cited in a history of Weare, New Hampshire as giving the oration at a Fourth of July celebration in 1827. After his marriage, Dr. Shute’s focus shifted away from medicine, and he joined his wife in an artistic partnership that took the couple through the hamlets and small cities of northern New England and New York State, selling their services as itinerant portrait painters. Their efforts met with considerable success until Samuel’s untimely death in Champlain, New York, in 1836, at the age of thirty-two. This apparently felicitous collaboration combined an attraction to multiple styles with an interest in experimenting with a diverse and unorthodox mixture of materials. The resulting body of work exhibits an astonishing vitality and complexity. When a portrait was painted in oil, the artists frequently interspersed applications of pigment with layers of varnish and glazes. When working on paper, their primary medium was watercolor, but that was freely supplemented with pastel, gouache, pencil, collage, gum arabic, and reserved blank areas in order to obtain different effects. The work is fresh and spontaneous, but great care seems to have been taken to obtain the individuality of the sitter, resulting in insightful renderings and likenesses that reflect a compelling desire of personal engagement. Among the most numerous of the Shutes’ clients were the young women who had recently left their family farms to work in the mills that were bringing prosperity to the river towns of Massachusetts and New Hampshire. The portraits celebrate the confidence of the subjects and affirm a gentle pride in their newly independent status. 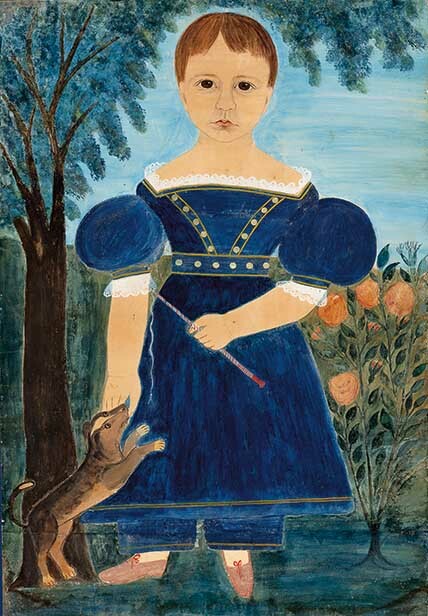 The Shutes were particularly effective in their sympathetic portraits of children, and the new additions to the American Folk Art Museum’s collection are outstanding examples of the artists’ ability to capture the dignity, vulnerability, and poignance of their young sitters. Ruth and Samuel had themselves become parents in 1829. Their daughter Adelaide was born an invalid, and she remained with her mother throughout her life. A second daughter, Maria Antoinette, followed in 1831, but she survived only nine days. Her grave is located beside that of her father in the Millville Cemetery adjacent to the grounds of St. Paul’s School in Concord, New Hampshire. It is highly probable that the experience of coping with this familial distress and loss explains the heightened sensitivity and quality of caring that distinguishes the young artists’ portraits of children. Although vital and intensely production, the Shutes’ joint career was tragically brief. The probability that Samuel’s early death was preceded by a lingering illness is evidenced by the fact that by September 1833 the paintings were signed by Ruth alone. In addition, the next known newspaper solicitation for portrait commissions that appears after that date, in the May 24, 1834, edition of the Plattsburgh (New York) Republican, mentions her name only. For four years following Samuel’s death, Ruth continued to travel in the region and to paint. Then, in 1840, she married Alpha Tarbell in Concord. She and Adelaide went with him to Lexington, Kentucky, where Ruth had two more daughters and where she is remembered as a pianist as well as a painter. Her last known painting, a portrait of a granddaughter, is dated 1874. 1. The History of Weare, New Hampshire, 1835–1888 (Weare, NH: 1888), 419, 603, 631. 2. Private collection. The following people were instrumental to our research on the Shutes: Mary Allis, Robert Bishop, Mary Black, Virginia Burdick, Bill Copely, Paul D’Ambrosio, Nancy Druckerman, Ralph Esmerian, Nancy Evans, Catherine and John Goodwin, Michael and Colleen Cowles Heslip, Vera and Pepi Jelinek, Rachel Johnson, Lou and Aggie Jones, May W. S. Jones, Sybil and Arthur Kern, Lee Kogan, Judy Lenett, Bertram and Nina Fletcher Little, Barbara Luck, Nancy Muller, Jacqueline Oaks, John Rexford, Tom Rizzo, Bert and Gail Savage, David Schorsch, Esther Schwartz, Stephen Score, Peter and Leslie Warwick, Alice Winchester, and Ruth Wolfe. Source: Stacy C. Hollander, American Radiance: The Ralph Esmerian Gift to the American Folk Art Museum (New York: Harry N. Abrams in association with American Folk Art Museum, 2001), 387–88.